Have you heard of Screen Free Week? 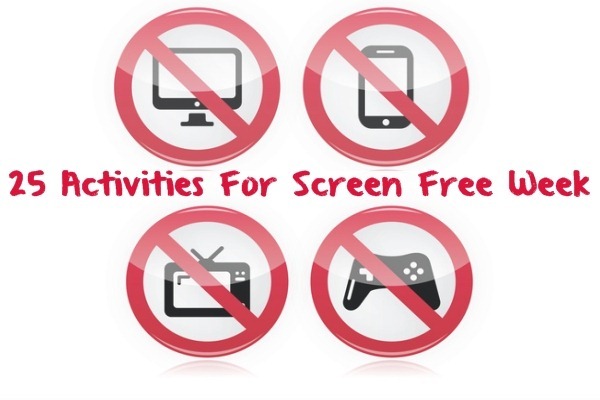 Screen Free Week is an annual event where parents are encouraged to turn off all screens including televisions, computers, tablets and video games in order to improve children’s well-being and connect with their families. This year, Screen Free Week will be observed during the week of April 29th. Of course, many parents will encourage their children to read during this time. However, you may have an easier time encouraging your kids to read if there are other kids involved. Find a book the children will enjoy and set a time to hold discussions to keep them engaged in the book. In most parts of the country, the weather starts to warm up quite a bit in late April, so you can make plans to take advantage of the weather. Many outdoor areas including beaches and water parks may wait until Memorial Day weekend for grand openings, but there are still plenty of things to do outside. You can take your children on a walking trail, or to a local park. Having an old-fashioned play date may be a great way to get your children away from the screens. Offer to get with other parents and take the kids to the park or another recreational spot such as a museum. You can also organize a gathering such as a pizza party so that the children can play board games or even learn some of the old-fashioned games you used to play outside such as freeze tag or hide and seek if you decide to take the action outside. You can also look into providing your children with other interests that will take them away from the screen. For instance, some children still strive to learn music instruments, so you can find out if they can take lessons. Comic books have also resurged as a hobby with many people of all ages, so you may even look into finding a series or two your children may like. Even old hobbies like model plane or train building may spark your children’s interest. Electronic games may be prevalent, but there is still some charm in playing old-fashioned board games. Getting the family together after dinner to play a classic board game can be just as fun as a video game. I still remember games such as Chutes and Ladders, Candy Land, Trouble, Clue and, of course, Monopoly. Now, there are even games based on popular films and television series’ that your children may enjoy. Because my main source of income comes from me being online, I won’t be able to disconnect completely, but I will be making an effort to get the family outside to have some good old-fashioned family fun! What other screen free activities can you think of? awesome post, awesome ideas. We all get so caught up in tv, games, texting, email, etc. to notice the world around us sometimes. This is a great thing to rectify that a little. Yes. Sometimes we need to go outside and take time to smell the roses! OOoh, this would be rough for me! LOL But, great suggestions! As soon as it gets nicer out I definitely want to get outside a lot more. At least with little kids, I’m always surprised at how well kids can stay entertained outside. My 2 year old nephew would be outside for 10 hours straight when the whether is decent, he never gets bored and we don’t have any “special” outdoor toys just a swingset, sandbox, pool, slide, little tikes car, etc but he rotates back and forth between the activities for hours and hours when we let him. That’s awesome Emily! I’m always amazed at how kids can stay entertained little when they’re outdoors. Great list! Since the weather’s finally turned nicer, we’ve had the tv off most of the time and it’s been great. The kids have more fun and I’m more productive too. I didn’t realize it was screen free week. I will have to do some stuff on my computer this week but it would be nice to take some time off and smell the roses. I would love to do this. My husband would NEVER go for it though. hmm… Need something to tempt him with. I admit it’s not easy to go screen free. Taking baby steps is key. Fantastic ideas. We have a screen free week every summer. We take the kids camping for a full week. No electronics are allowed. No electronic games, etc. It is one of the best weeks of the year. Up there we do a lot of hiking, playing in water, exploring, reading, and playing games with family. We’ve never tried a screen free week at home before. Maybe because the temptation is too strong and I Don’t really want to manage all the whinnying from the kids. But we may try a few days and see how it goes. You’re right! Seems like it may be alot easier to do while camping. It’s hard for me too! I have to work!